I downloaded the GNOME 3.16 live demo image and experimented with what the latest GNOME has to offer. My focus is usability testing, so I wanted to explore the live demo to see how the usability has improved in the latest release. Testers typically looked for a "font" or "text" action under the gear menu. 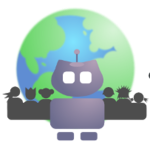 Many testers referred to the gear menu as the "options" or "settings" menu because they previously affiliated a "gear" icon with settings or preferences in Mac OS X or Windows. Testers assumed changing the font was a settings, so they looked for it in what they assumed was a "settings" menu: the gear menu. Most testers preferred to just move a frequently-used folder to the desktop, so it would be easier to find. But GNOME doesn't have a "desktop" per se by default, and expects users to use the "Bookmark this Location" feature in Nautilus. However, this feature was not very discoverable; many testers moved the target folder into another folder, and believed that they had somehow bookmarked the location. When asked to make to replace all instances of a word with another word, across a large text file, testers had trouble discovering the "find and replace text" feature in gedit. Instead, testers experimented with "Find" then simply typed over the old text with the new text. The new gedit features a clean appearance that features prominent "Open" and "Save" buttons—two functions that average users with average knowledge will frequently access. A new "three lines" icon replaces the gear menu for the drop-down menu. This "three lines" menu icon is more common in other applications, including those on Mac OS X and Windows, so the new menu icon should be easier to find. 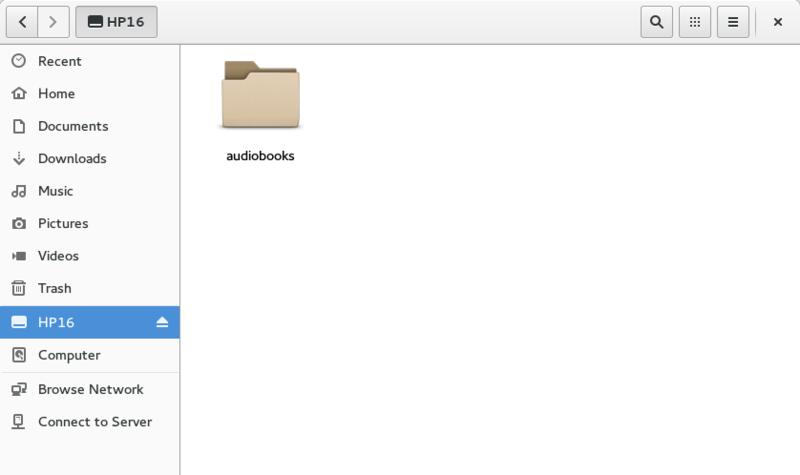 The "Open" menu includes a quick-access list, and a button to look for other files via the finder. 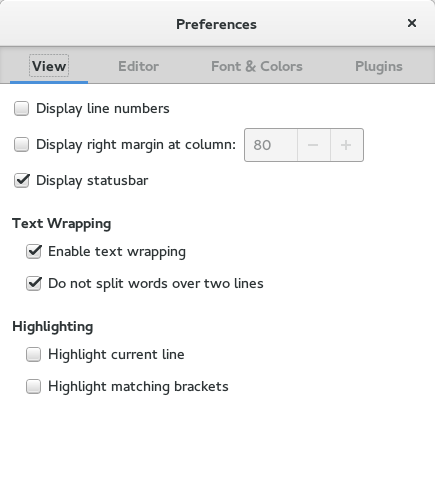 The preferences menu doesn't offer significant usability improvements, although the color scheme selector is now updated in GNOME 3.16. The updated Nautilus features large icons that offer good visibility without becoming too overwhelming. The "three lines" menu is simplified in this release, and offers an easier path to bookmark a location. 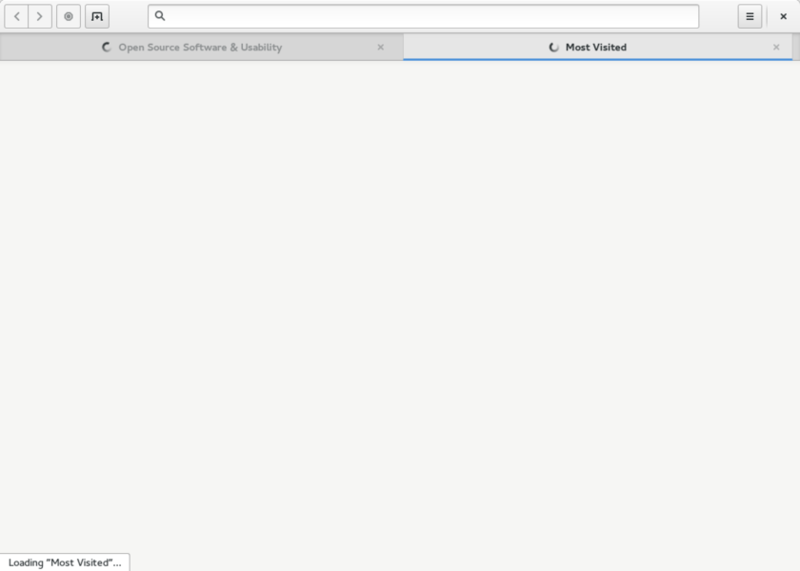 I uncovered a few issues with the Epiphany web browser (aka "GNOME Web") but since I don't usually use Epiphany (I use Firefox or Google Chrome) I'm not sure how long these problems have been there. Epiphany has a clean appearance that reserves most of the screen real estate to display the web page. This is a nice design tradeoff, but I noticed that after I navigated to a web page, I lost the URL bar. I couldn't navigate to a new website until I opened a new tab and entered my URL there. I'm sure there's another way to bring up the URL bar, but it's not obvious to me. I'll also add that taking screenshots of Epiphany was quite difficult. For other GNOME applications, I simply hit Alt-PrtScr to save a screenshot of my active window. But the Epiphany web browser seems to grab control of that key binding, and Alt-PrtScr does nothing most of the time—especially when the "three lines" menu is open. I took several screenshots of Epiphany, and about half were whole-desktop screenshots (PrtScr) that I later cropped using the GIMP. EDIT: If you click the little "down" triangle next to the URL, you can enter a new URL. I don't like this feature; it obscures URL entry. Basic functionality like this should not be hidden in a web browser. I encourage the Epiphany team to bring back the URL entry bar in the next release. 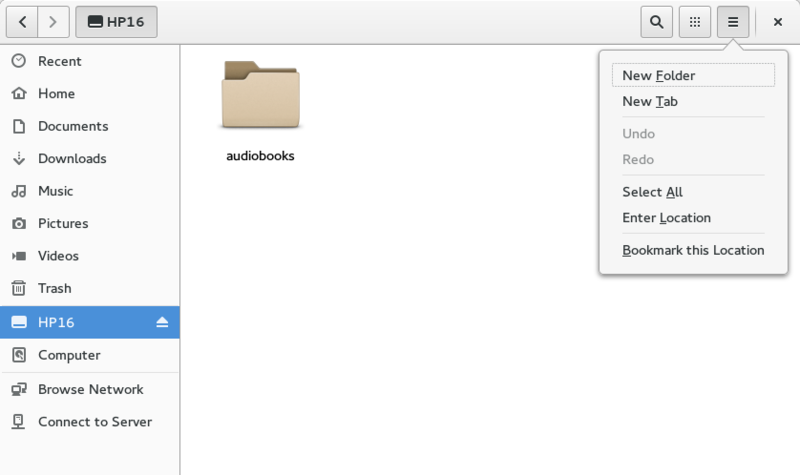 Notifications got a big update in GNOME 3.16. 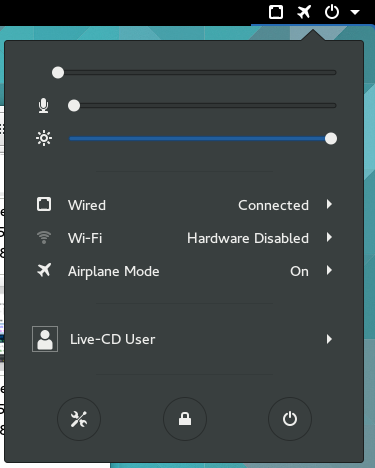 In previous versions of GNOME 3, notifications appeared at the bottom of the screen. Now, notifications appear at the top of the screen, merged with the calendar. You might consider this a "calendar and events" feature. The notifications are unobtrusive; when I plugged in my USB fob drive, a small white marker appeared next to the date and time to suggest a new notification had arrived. While I haven't reviewed notifications as part of my usability testing, my heuristic evaluation is that the new notifications design will improve the usability around notifications. I believe most users will see the new "calendar and events" feature as making a lot of sense. However, I do have some reservations about the updated GNOME. For one, I dislike the darker colors seen in these screenshots. 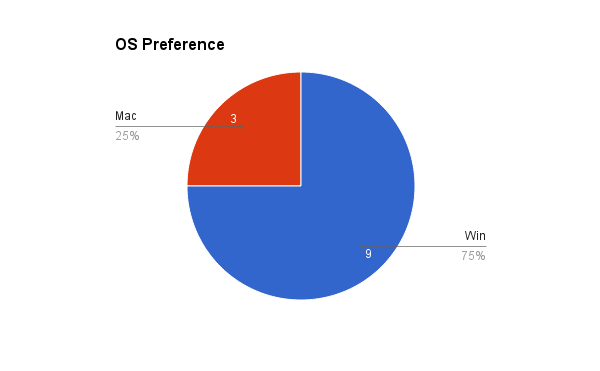 Users don't like dark desktop colors. In user interface design, colors also affect the mood of an application. 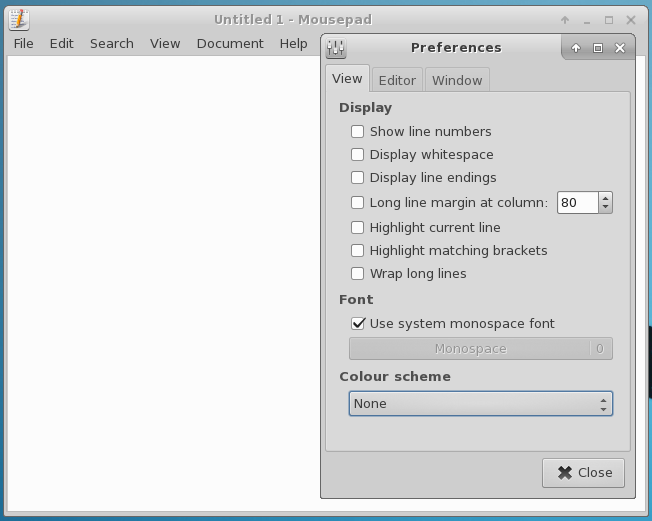 As seen in this comparison, users perceived the darker colors used in Windows and GNOME as moody, while the lighter colors used in Mac OS X suggest an airy, friendly interface. 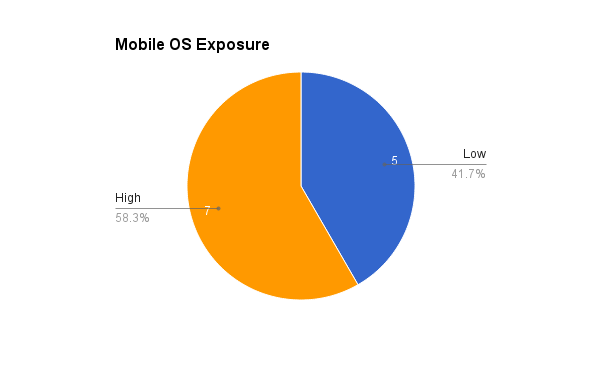 This may be why users at large perceive the GNOME desktop to have poor usability, despite usability testing showing otherwise. The dark, moody colors used in GNOME provoke feelings of tension and insecurity, which influence the user's perception of poor usability. I'm also not sure about the blue-on-grey effect to highlight running programs or selected items in the GNOME Shell. In addition to being dark, moody colors, the blue-on-grey is just too hard to see clearly. 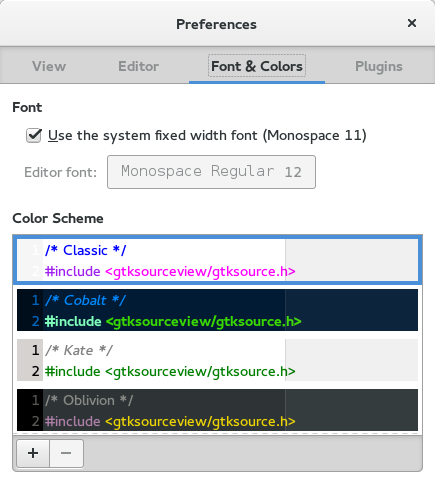 I would like GNOME to update the default theme to use lighter, airier colors. I'll reserve a discussion of colors in GNOME for a future article. Overall, I'm very pleased with the usability improvements that have gone into the new GNOME release. Good job, everyone! I look forward to doing more usability testing in this version of GNOME, so we can continue to make GNOME great. 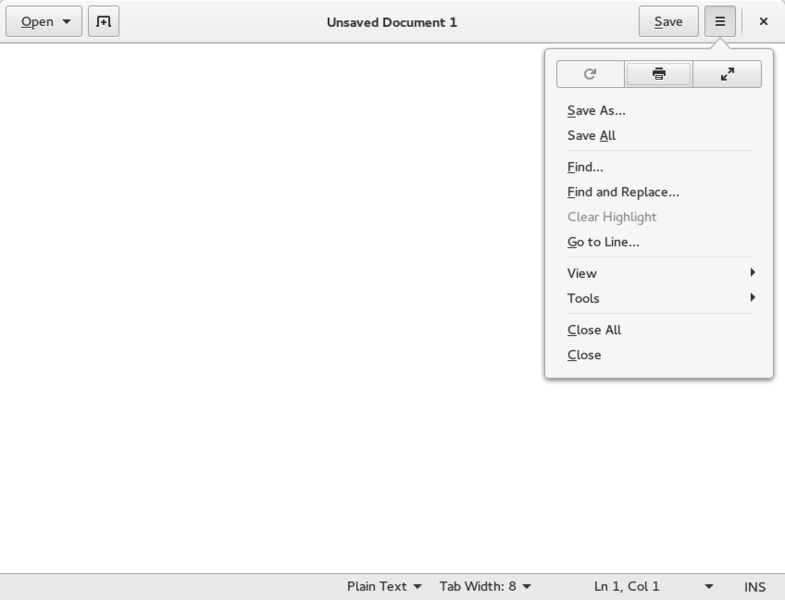 With good usability, each version of GNOME gets better and easier to use. I have been mentoring Sanskriti Dawle as part of the GNOME Outreach Program for Women. Sanskriti has been working on a usability test of GNOME, an update from my own usability testing which I also shared at GUADEC 2014. I encourage you to watch Sanskriti's blog for the final results, but I wanted to share a view into her excellent work. You might treat this as a preview of Sanskriti's results. This is important, because GNOME wants to be useful to what I call "average users with average experience." 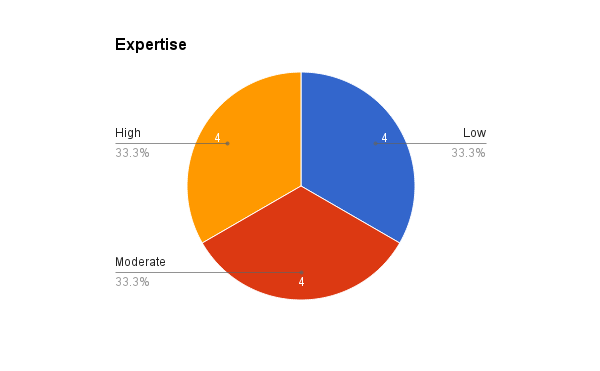 And Sanskriti's usability test participants represent that. 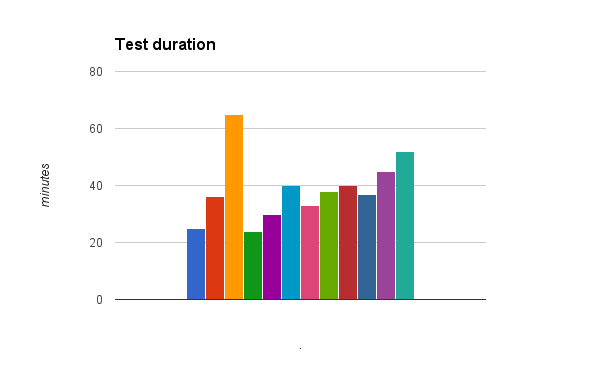 I asked Sanskriti to use the heat map method to display her usability test results. This is a method I developed during my master's program research, and refined in later usability testing. 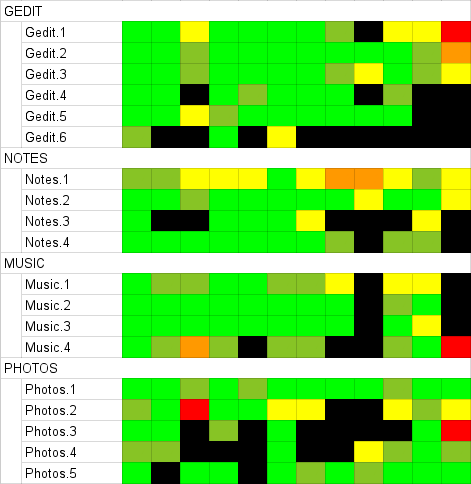 In a usability heat map, each scenario task in the usability test is displayed in rows, and each tester is shown as columns. Each tester's experience for every scenario task is represented using a colored block: green if the tester completed this task successfully with little or no problems, orange if the tester experienced some problems but was still able to complete the task successfully, red if the tester encountered great difficulty but still completed the task. And black if the tester was completely unable to finish the task. 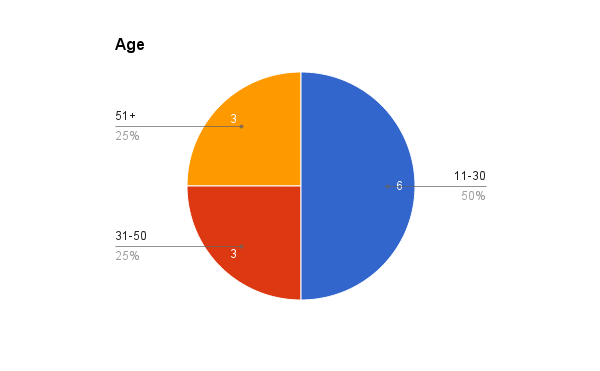 I can make a few initial observations from this data. Looks like testers had the most difficulty with tasks Gedit.6 and Photos.3 and Photos.4, with noticeable difficulty in tasks Notes.1 and Photos.2. There's some interesting data around tasks Gedit.1 and Music.1 that might reflect testers 9, 11, and 12. This is only a preview of Sanskriti's results. I encourage you to watch Sanskriti's blog for the final results, which I hope to see in the next week as she wraps up her work in the internship. You may have noticed that the application process for Outreachy in May-August have opened, but usability testing isn't on the list yet. I've been starting to realize that I've overcommitted myself on a number of projects, so I think I'll sit out the Outreachy in May-August, and join again in Fall. One applicant (initials “G.D.”) had reached out to me in February about participating in Outreachy for usability, and at the time I said yes. I support G.D.'s application, and will gladly mentor her if she is selected. But I prefer not to sponsor additional applicants until I have more free time. Otherwise, I'm concerned I won't be able to provide sufficient mentoring. 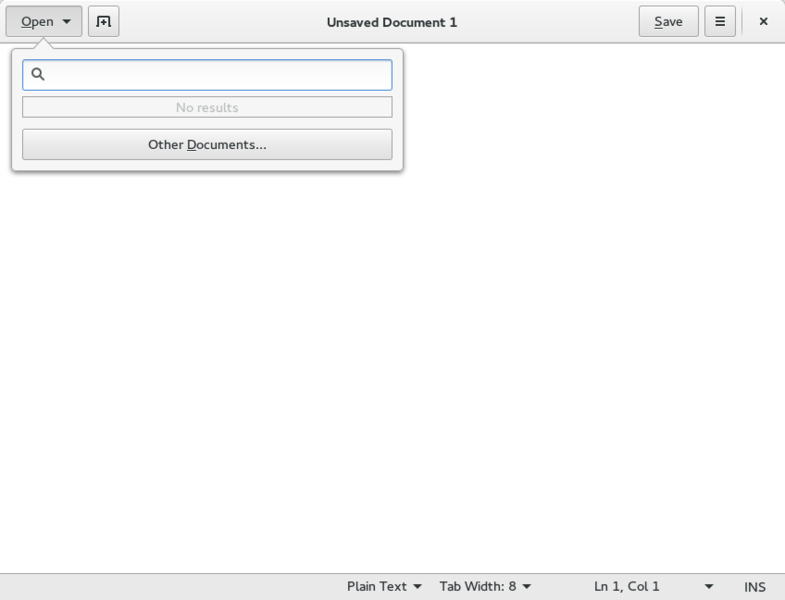 Edit: I've added an entry for usability testing for GNOME Outreachy for the benefit of G.D. If anyone is particularly interested in doing usability testing as an Outreachy project, let's discuss before you submit an application. I don't want to set any false expectations for you. A colleague recently shared an article from LifeHack: 20 Tricks That Can Make Anyone An Excel Expert. The article is meant to turn you into a power user of Excel, able to uncover the features of the spreadsheet and make you more efficient. Click the square between column "A" and row "1" to select everything. Select multiple files at once to open them all. Use Ctrl-Tab to switch between spreadsheet tabs. Customize the toolbar using the File→Options→Quick Access Toolbar menu. Create diagonal lines in cells using the Home→Font→Borders menu. Drag and select X rows (or columns) to insert X new rows (or columns) at once. Drag highlighted columns or rows to new locations. Show or hide blank cells using the Data→Filter menu. Use wildcards when searching with Ctrl-F. Use ? to represent one character and * to represent more than one character. Generate unique data using the Data→Advanced menu. Validate your input using the Data→Data Validation→Setting menu. Jump to the edge of the sheet using Ctrl + arrow keys. Transpose a table when copying and pasting, using the Home→Paste→Transpose menu. Combine text from multiple cells using &. Change text to uppercase and lowercase using the UPPER(), LOWER(), and PROPER() functions. Insert literal text into a cell using the single quote mark. Create your own shorthand using the File→Options→Proofing→AutoCorrect Options menu. Right click in the bottom right to get more stats on cells you've highlighted. 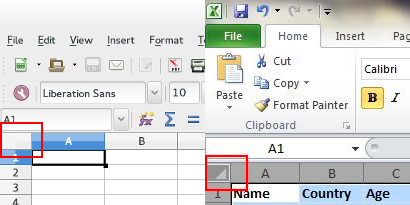 Double-click a spreadsheet tab to rename it. I knew most of these features already, having used OpenOffice, LibreOffice, and Microsoft Office for years. But I also admit that most of these features are opaque, hidden from the user. The method to select multiple files and switch between tabs is used in other application programs, including the web browser (Ctrl-Tab) and the file manager (select multiple files). Navigating to the edges of a spreadsheet using Ctrl + arrow keys is somewhat discoverable, although this may happen by accident until the user figures out how to reproduce the desired behavior. Other features are a matter of learning the functions available in the program, such as changing text to uppercase and lowercase using the UPPER(), LOWER(), and PROPER() functions. Software must strike a balance between what is easy to use, what is discoverable, and "power" features for "advanced" users. Will most "general" or "average" spreadsheet users need to validate their input? Or create custom "shorthand" when entering in complicated, repeated text? Probably not. But perhaps many "general" or "average" users will want to "flip" a table using the "transpose" feature. I'm not particularly critical of this spreadsheet example, as I know many "general" users use spreadsheet programs to do simple calculations or to create tables to organize basic data (such as an inventory of books on a bookshelf). But let this and any other "power features" article serve as reminders that software should be accessible by all, both "average" and "power" users. 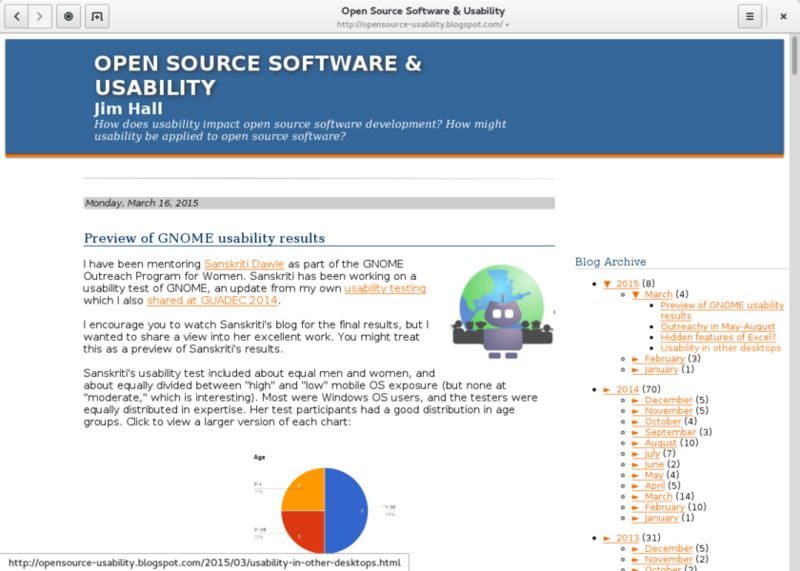 While I have been blogging a lot about usability in GNOME, this blog is about the usability in open source software. So I wanted to highlight another open source software project that recently posted an updated release with improved usability. Xfce uses a more traditional desktop metaphor, with a panel at the bottom of the screen to launch programs, and an "Applications" menu at the top-left with open windows listed along the top bar. The panel and top bar are dark grey, but the default desktop is otherwise a cheerful light blue that should influence a positive user experience. Application windows are well-drawn, and it's clear in the screenshot which program has focus because of the subtle clues in the program window's title bar. The "active" window uses dark text on a light grey title bar, while "inactive" windows use an "iced out" title. Even the window controls provide visual hints: the "active" window has clearly defined window controls, while "inactive" windows do not. I believe that users would respond well to the more typical use of menus. 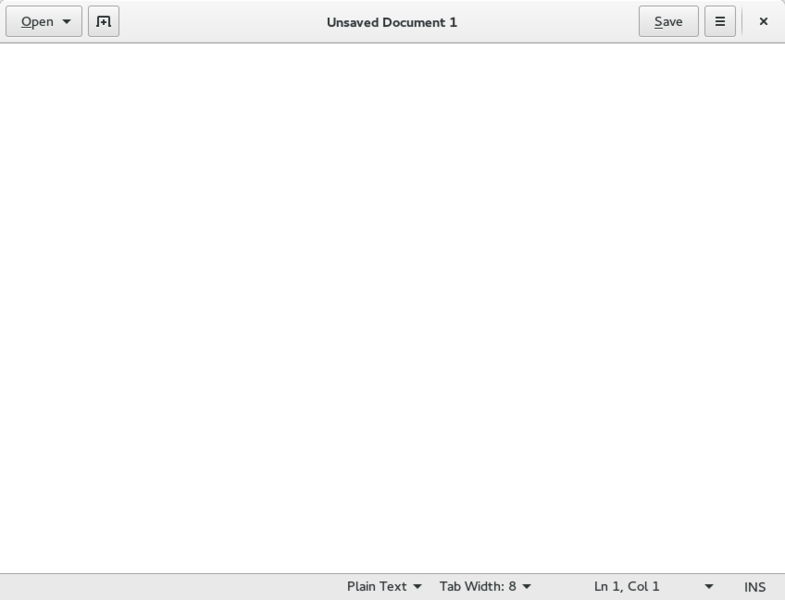 The application top bar is reserved for the program name plus a few window controls (minimize, maximize, close). 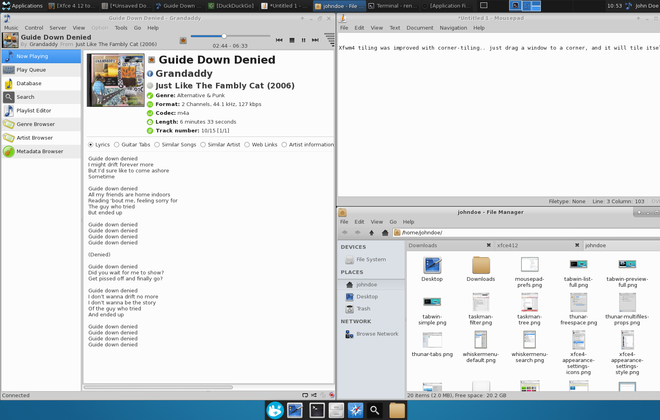 Overall, the new Xfce seems very nice, and should provide a very positive user experience. Judging by screenshots, I think the Xfce project made huge strides in usability. I'm sure Xfce 4.12 will appear as an available "spin" of the next Fedora Linux distribution. The Fedora 22 release schedule suggest the new distribution will be available in May, and I look forward to testing it. I especially would like to compare Xfce's usability to 4.10, which was overall very good but had a few usability issues, notably in installing printers and adding new software. Will the new Xfce still be an improvement? I can't wait to find out.